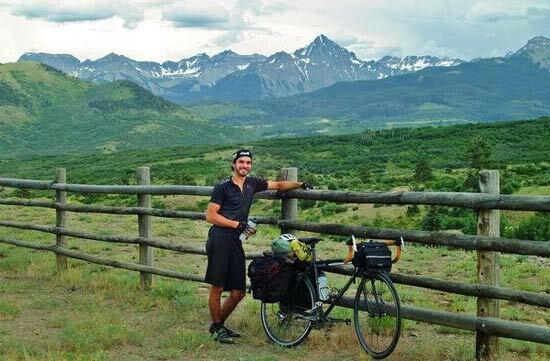 Wanderer Cole Starkey will soon embark on a 30 day–3,000 mile–bicycle ride down the Atlantic Coast and west to New Orleans to raise money and awareness for Haiti. The ride is an effort to raise awareness of and support for the Vermont Haiti Project’s earthquake relief work in Port Au Prince, Haiti. The concept of Ride for Haiti is very simple; I am going to get on my bike and ride. On March 8th I plan on following AdventureCycling.org’s Atlantic Coast bicycle route from Norristown, PA to St. Augustine, FL where I will pick up their Southern Tier route to St. Francisville, LA. The route as written is 2,259 miles; however I will be adding a ride from Glenside to Norristown and a ride from St. Francisville to New Orleans, I also know from previous touring experience that an additional 10-20 miles can be expected per day to reach services. In 2007 I went on a solo bicycle tour of America going coast to coast from Yorktown, VA to San Francisco, CA. It was really overwhelming to me the amount of public interest I attained; from newspaper articles to a barrage of questions from friends, family and complete strangers along the way; everyone wanted to know the story behind my experience. At that time it was simply something I wanted to do. This time, however, I want to make sure that all this interest is focused towards something positive. I will be handing out and posting flyers at every opportunity along my tour. The flyers in conjunction with word-of-mouth outreach leading up to, during, and following the ride is all aimed to direct people to our website: www.rideforhaiti.org. Through the site people will be able to follow my ride through an ongoing travel log, read about the Vermont Haiti Project and furthermore make a contribution to their organization. The donation option leads directly to the Vermont Haiti project’s website where donors will have the option to choose the specific program they would like their contribution to benefit. The Vermont Haiti Project was formed in 2007. It is the formal extension of the former “Project Haiti”, which for 18 years has been involved with humanitarian services in rural Haitian mountain region north of Port-au-Prince. VHP has always functioned as a grassroots, volunteer organization whose activities are constantly evolving and expanding in line with the needs of our partner Haitian communities. The goal of Ride for Haiti is before all else: to raise public awareness when it has otherwise diminished. It is inevitable that news organizations slowly fade their coverage away from a disaster in the months to follow, however this is the most critical time in the recovery process. The Vermont Haiti Project, who were there before the earthquake and will continue to work to build a more sustainable Haiti in the years to come, serve as the perfect partner in this project.